JAZZ IS DEAD is back Los Angeles! 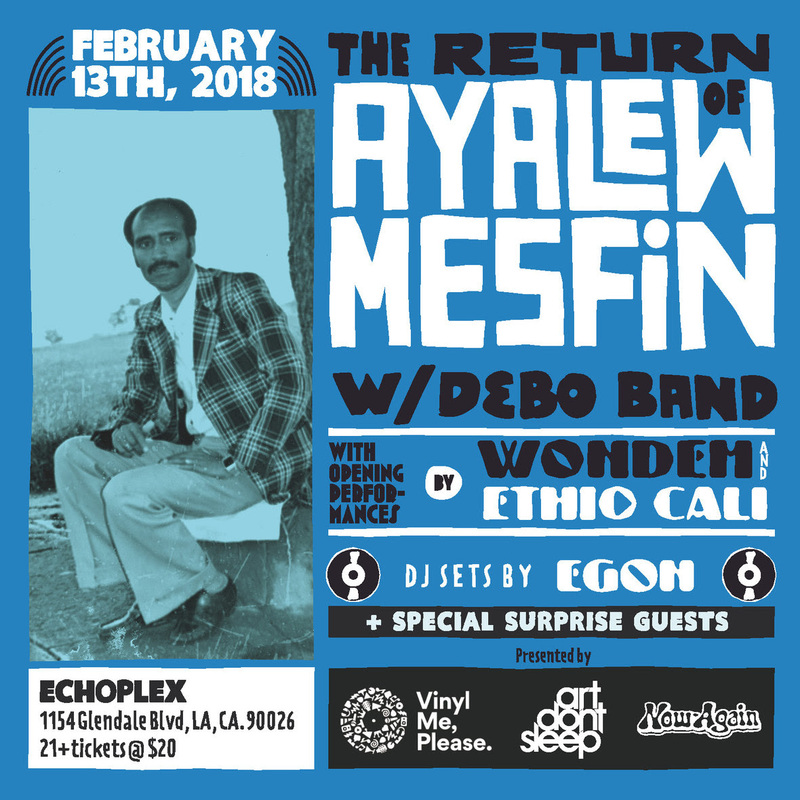 The Return of Ayalew Mesfin, The 70’s Ethiopian Funk God! From the album Hasabe (My Worries), a Now-Again x Vinyl Me, Please release, coming January 23. Ayalew Mesfin is among the legends of a 1970s Ethiopian funk era whose music was forced underground by his country’s government. Now, over 40 years later, his triumphant return gives us a chance to discover a rare & beautiful moment in music history. We’ve been working really hard on this and we are excited to be presenting it to you. If you purchase entry into one of the events, you will be granted entry into both events. This is a very special one time happening and only going down in Los Angeles! Celebrating 20years of Spaceways Radio with Carlos Niño! One of my earliest memories of Carlos Niño has to do specifically with Spaceways radio. It was about 7 years ago. I was working on an event with ArtDontSleep, running around from backstage, to stage, to ticket booth and back… regular event stuff. I held on to a question a close friend of mine had for him all night about a song he played on his show at least 5years prior. I believe Carlos hosted this event or was DJing it or maybe perhaps he connected us with a particular musician, I don’t recall the specifics but the point is, he stuck around til the end of the night allowing me to ask him about this particular song. I doubted anyone would remember with the small amount of details my friend left me with but sure enough by the time we wrapped up the night and I drove home the song I asked about was in my inbox. I was shocked and incredibly thankful. I’m blessed to say that moments like these are not rare with Carlos Niño. Always connecting folks, building, guiding, continuously offering a wealth of information and inspiration. 2015 marks 20years of Spaceways Radio, we’re celebrating with Carlos and joining him Sundays 10pm-Midnight PST on KPFK as he counts down to the final 9 shows with special guests aligned every week. “My final Radio broadcast will be Sunday, March 22, 2015. Los Angeles, for me. It’s been an incredible experience! Lots of experiences. I’m truly grateful for the extended opportunity to grow and share on the air! and NANNY CANTALOUPE of Dublab. March Calendar is about 99% confirmed. It’s a true honor to pass my Sundays 10:00pm – Midnight Pacific time slot on to one of the greatest DJs of all time: J.ROCC! Please tune in to KPFK on Sunday, March 29th for the premier of his new program. “I started my first radio show, All At One Point*, on KPFK 90.7FM, Los Angeles in October 1995, after volunteering at the station as a student reporter and producer from Summer 1994*. All At One Point was focused on “Hip-Hop, Soul, Jazz, and World Rhythms.” While hosting the show on Wednesdays from 8:00pm – 10:00pm Pacific, I showcased some of my favorite contemporary artists and featured live in studio performances and interviews with a wide variety of legends, up and coming musicians, bands, and DJs. individual artists and bands, phases of the Zodiac, and years past. time that All At One Point and Spaceways aired. I’m a founding DJ of the internet radio station Dublab where many of my Spaceways Radio Archives are available. I was a monthly contributor to David Lynch Radio, and Scion Radio, and have made several special mixes for various BBC shows and channels, Red Bull Music Academy Radio, and other stations in Europe and Japan. All At One Point* Named after Italo Calvino’s short story from Cosmicomics. radio was when I turned 16 in 1993, got my driver’s license and drove my Mom’s car to answer phones at KCRW. I did some introductory production assistance there too. Playlist entry, ticket give-away phone operator . . . I picked up food for the fund drive, etc.. While at the station I came across one of the coolest things ever – a folded card-stock printed guide to every public radio station in the United States, with dial numbers, call letters and cities. Being that I lived in Canoga Park, when I saw KPFK in North Hollywood on the list, I decided to check it out. I was always focused on being a Music Programmer, but got to do a few other little odd jobs in radio first . . .
nueve – a monthly musical potluck celebrating music lovers and their record collections in revolutions of nine. *everyone is welcome to bring 9 records to share (for this specific nueve we’re encouraging folks to bring 45s in particular) or simply your ears, stop by, tune in and join the musical conversation every final (vinyl) friday. join us! hosted by: DANNY HOLLOWAY aka Smokinvinyl!